I’ve decided to work full-time on the issue of pipelines and oil tankers. Today is my first day at Dogwood Initiative, a nonpartisan group in Victoria working to organize British Columbians around a unique democratic opportunity. You can read more about how I came to believe in the idea of a citizens’ initiative on oil tankers here on the Dogwood blog. Last weekend, the Manning Conference brought together the conservative movement’s best and brightest in Ottawa for two days of seminars, speeches, and strategy sessions. Photographer Alex Tetreault and I were there for The Tyee, looking to get a sense of who might lead the party into its next era. I’ll say this: the bench is deep. 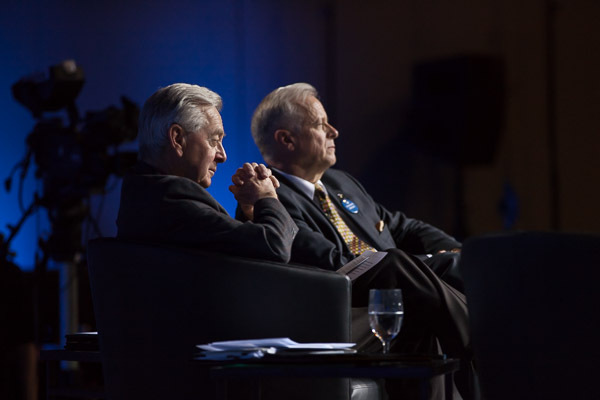 Reform Party founder Preston Manning listens to a speech with Jay Hill, the Conservatives’ fearsome former whip. Photo by Alex Tetreault. The crowd chuckles. There are indeed a few clean-cut young men in attendance with gun pins on their lapels — they’re annoyed by the RCMP’s recent decision to ban a Swiss military-style rifle. Other buttons pinned to people’s jackets and conference lanyards betray more momentous concerns: the Senate, Rob Ford, pipelines, Justin Trudeau. “That 26 per cent is a little bit misleading,” he continues. “It’s really driven by one region in Canada.” The Prairies. There, Conservative support has grown by five points since last year, to 48 per cent. Meanwhile in B.C. it has dropped five points, to 20 per cent. In a result Turcotte calls “weird,” a full 68 per cent of British Columbians say they believe the country itself is on the wrong track. If he’s right, B.C. has a pivotal role to play in the near-term fortunes of the Conservative Party of Canada. That relationship could look very different depending who leads the party next, after Stephen Harper. To be clear, there is no leadership race officially underway. 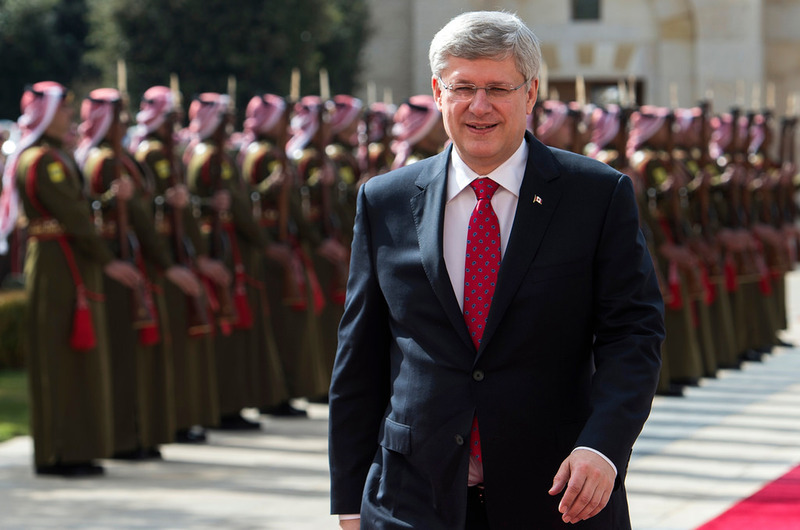 Harper continues to say he will run in the next election. Nonetheless, and perhaps it was a coincidence, this weekend Manning Conference delegates got a chance to compare four more-or-less viable candidates to lead the party into its post-Harper era — whenever that begins. CLICK HERE TO CONTINUE READING “After Harper, Who?” on The Tyee. 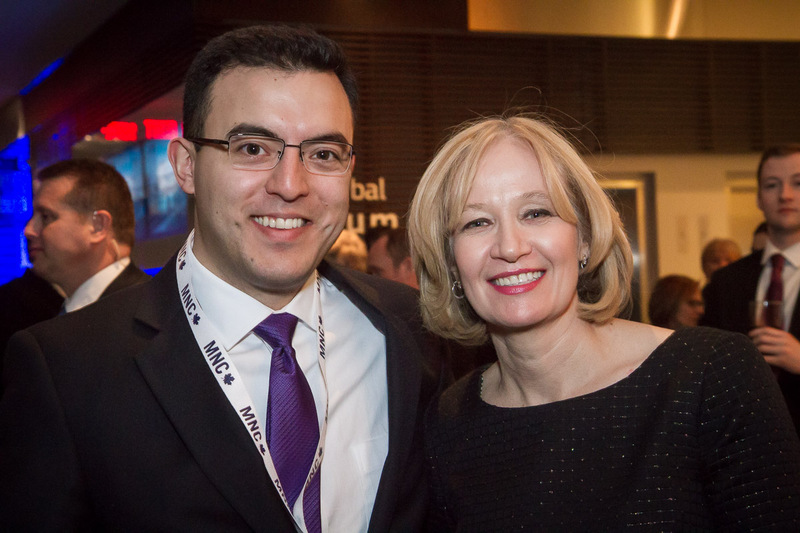 The author with Laureen Harper. Photo by Alex Tetreault. CLICK HERE to hear from Laureen Harper and Preston Manning in “The Family Conservative,” our Friday dispatch. The Irving Oil refinery in Saint John — Canada’s largest, so far. There’s an interesting rumour bobbing around on B.C.’s North Coast. David Black, owner of the Black Press chain of community newspapers, is said to be launching a new regional magazine focused on natural resource development. If Black is tempted to use his new magazine to build momentum for his Spruce Goose of a refinery project, he’s wasting his time. Like Howard Hughes’s doomed eight-engine flying boat, Kitimat Clean is a grand idea, but not one based in economic or political reality. The whole purpose of shipping Alberta bitumen to the coast, whether by pipeline or rail, is so that oil sands producers can charge more money for a barrel of crude. Right now, refineries in Asia are hungry for heavy oil. They’ll pay more than refineries on the North American continent — where most can’t process low-grade oil sands crude, and pipelines to the ones that do are fully booked. If you can build a bridge between North American oil deposits and Asian refineries, the price difference is yours to pocket. Hence the eagerness of Enbridge, Kinder Morgan, and those who stand to cash in when the price of Canadian oil jumps. Like the other West Coast export proposals, Kitimat Clean is in no way designed to supply energy to British Columbia. That’s not where the demand is. The market is in Asia. As it says on the Kitimat Clean website, “up to 100%” of the diesel and gasoline made in Kitimat would go to fuel cars and trucks in Asia. David Black’s logic is this: let’s build a new Chinese heavy-oil refinery, except not in China. The bitumen would still be mined in Alberta and burned in China. The construction loans would still come from China. But the processing infrastructure would be built this side of the Pacific. There would still be a couple hundred supertankers leaving Kitimat every year, but they would carry refined products — which are easier to clean up than diluted bitumen when they spill. Here’s the problem: that’s not what the oil sands producers signed up for. If they’re going to dig their product out of the ground (an increasingly costly endeavour), dilute it with condensate, then pay a toll to pipe it more than 1,000 kilometres, they want a buyer who will make it worth their while. A new heavy-oil refinery in Canada would have to be built from the ground up, meaning construction workers would expect Canadian wages, not Chinese wages. No problem, says Black. The refinery components could be built in China, then shipped across the Pacific and assembled by Canadian workers, thereby cutting costs. But a new refinery would also require people to operate it. Black claims 3,000 full-time jobs would be created in Kitimat. Unless the entire staff is also imported from developing countries, Kitimat Clean would presumably employ unionized Canadian energy workers, with wages and benefits superior to developing countries. A refinery operating in B.C. would also pay B.C. and Canadian taxes, and be subject to B.C. and Canadian laws. That includes environmental regulations, which, though weakened of late, are still far stronger than in developing countries. Indeed, Black claims his project will use a bunch of fancy, expensive engineering processes to reduce carbon emissions. Hence the “Clean” moniker. All of that makes it harder for a Chinese refinery in Canada to compete with a Chinese refinery in China. Unless Kitimat Clean can pay the same price for heavy oil as the big refineries overseas, the shippers will continue to push for ways to load raw bitumen onto tankers. Meanwhile, the project would have to pass muster with First Nations and B.C. voters. David Black runs community newspapers across the province. He must know what he’s up against. 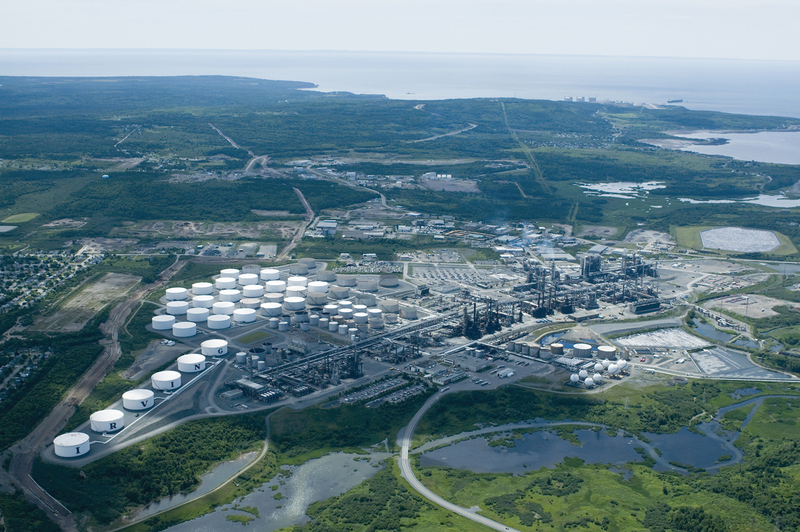 The largest refinery in the country right now is the Irving Oil facility in Saint John, New Brunswick (see photo above). To soak up the entire capacity of the Northern Gateway pipeline, Kitimat Clean would have to be twice the size of the Irving refinery. Any reduction in scale would mean crude oil tankers sailing B.C.’s inside coastal waters, which puts the whole idea back to square one. So it has to be gigantic. Kitimat Clean, by David Black’s estimates, would emit 7 megatons of CO2 every year. That’s the equivalent of 11% of the entire province’s current carbon emissions — not counting any pipelines, trains or oil tankers involved. Most significantly, the refinery would require feedstock: 550,000 barrels per day of oil sands crude, shipped either by pipeline or rail car across the Rocky Mountains and over hundreds of streams and rivers. Under the Save the Fraser Declaration, a piece of Indigenous law signed by 130 First Nations, that’s a no-go. Which begs the question: why build the refinery on the B.C. coast? Why not build it in Alberta? Andrew Weaver, the Green MLA for David Black’s home riding, suggests a compromise: let the private sector finance upgraders in Alberta. That way, the product travelling to the refinery would be a form of synthetic crude, rather than diluted bitumen. Perhaps First Nations would drop their opposition if the pipeline carried upgraded crude. Perhaps not. Either way, it may not be profitable to build upgraders in Alberta — even with significant government investment. In December the Sturgeon project, which is less than one-tenth the capacity of Black’s proposal, suffered another setback as cost estimates ballooned to $8.5 billion. Like the world’s largest flying boat, the whole scheme starts to sound a bit unwieldy. The Fraser Institute, a pro-industry think tank, calls the West Coast refinery proposal a “red herring” — and suggests Andrew Weaver’s support is actually part of a clever plan to keep oil sands crude in the ground. Where will the money come from to build this new refinery? Certainly some is on the table from the investment sector: the Industrial Commercial Bank of China has pledged up to $16 billion for the project. But a goodly share of risk will land on Canadian taxpayers. It has been proposed that Ottawa put up another $8 billion in loan guarantees to help finance the project, an idea already rejected by Natural Resources Minister Joe Oliver. It should go without saying that a project needing loan guarantees for one-third of its costs obviously lacks sufficient attractiveness to private investors, a clear indicator that the project rests on dubious economic grounds. So the biggest project in the history of the province, backed by the largest bank in China, currently exists as a WordPress blog and an expired burner phone in Surrey. David Black appears to be Kitimat Clean’s sole employee. Perhaps the newspaper baron is putting his time and resources into his new oil & gas magazine, or a formal project application. I’ll believe it when I see it. In the meantime, I’d prefer to concentrate on real oil export proposals — the ones supported by oil sands producers, industry-funded think tanks, Alberta politicians, and the National Energy Board. I’ve just joined more than 500 other British Columbians applying to the National Energy Board to participate in hearings on the proposed Trans Mountain pipeline and oil tanker terminal expansion. I picked “Intervenor” because the NEB eliminated the option for citizens to provide a simple oral statement, as part of efforts to speed up the approval process. Your only other option is to submit a letter of comment, which they claim to read and factor very carefully into their final decision. No thanks. 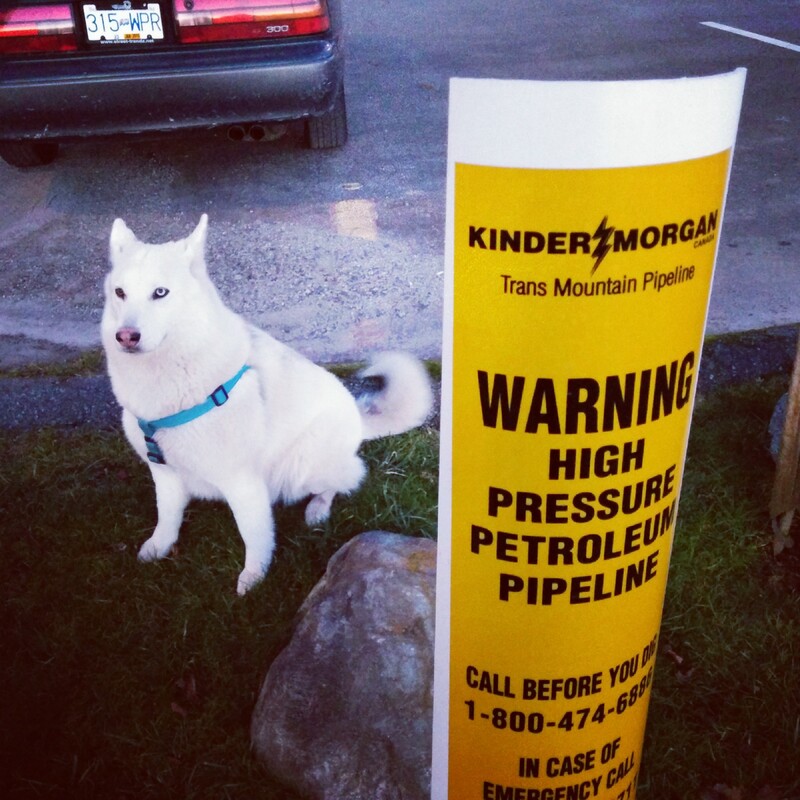 I want the power to cross-examine Kinder Morgan executives, on the public record. And enter evidence, and call witnesses, and make closing arguments. You don’t have to do any of those things as an Intervenor, or make much of a time commitment at all, but I like that an ordinary citizen can still apply for that status. I was expecting it to be a giant hassle, but thankfully it only took a few minutes. The most challenging part was explaining, in 500 words or less, how I am “directly affected” by the proposal. In an economic sense, I think every taxpayer, public service user, and gasoline buyer in British Columbia would be directly affected if Kinder Morgan got to export 890,000 barrels of oil sands crude every day for the next 30 years. I also think there are long-term, cumulative impacts on climate that need to be addressed. But I know that will be outside the mandate of any review panel. Then I took a look at the spill maps Kinder Morgan submitted as part of its application to the NEB, and I realized my stake in this project is not abstract, it’s deeply personal. I’ve pasted my explanation to the federal government below, along with some resources if you’re thinking of applying. Please note that February 12th is the absolute last possible deadline. After that, the window to participate in this review slams shut. Walking my dog friend near the pipeline route a couple weeks ago. As a resident of the Vancouver area, I have concerns about economic, ecological and public health risks in areas overlapping with Kinder Morgan’s spill models. The waterways and shorelines that would be affected in many accident scenarios are places where my family has lived, worked, played, and harvested food over four consecutive generations. I seek reassurance from the proponent regarding safety and value implications for three properties. One is my grandmother’s house in North Burnaby, 1200 metres from the proponent’s existing pipeline and 3100 metres from Westridge Marine Terminal. In some simulations of spill events submitted by the proponent, plumes of airborne volatile compounds overlap with my grandmother’s address. I have similar concerns regarding a second house owned by my parents, 1500 metres from the edge of Burrard Inlet in Vancouver. Given that I share responsibility for the care and safety of occupants at both addresses, I have questions about the spill models, warning systems and evacuation procedures for both neighbourhoods. The third property is a waterfront cottage on Mayne Island, constructed by my late grandfather. He grew up in the community of Miner’s Bay in the 1920s, where I too spent countless hours as a child, fishing and exploring the beaches. I continue to stay roughly two weeks a year at the property, which is owned by my grandmother. It is important to me that current and future generations of our family experience this unique locale. Again, spill models submitted by Kinder Morgan show oil could hit the beach at Miner’s Bay within one day of a tanker accident in the Strait of Georgia. Finally, I’m a hunter and angler with an interest in the long-term integrity of the Fraser watershed and Salish Sea. In terms of recreation, in the last six months I have gone swimming, held picnics or walked the dog at Indian Arm, Belcarra, Confederation Park, New Brighton, Crab Park, Stanley Park, English Bay, Kitsilano Beach, Spanish Banks, Willows Beach and Clover Point, all areas that could be rendered unusable by an oil spill. It’s unclear why the project is needed in my community, or whether the risks my family and neighbours will face are offset by the potential rewards. On a larger scale, the economics have yet to convincingly demonstrate that this project is in the national interest, especially from the perspective of a resident of Vancouver. If you want to join me and the other 500 folks who have applied so far, a few organizations have prepared resources to help you. – The Dogwood Initiative has built a microsite called “Step Up” with background on the project, pipeline maps, spill maps, and a step-by-step guide to get you through the online signup. – My grandma’s MP, Kennedy Stewart, has built a site called “Let BC Decide” with a detailed route map for Burnaby, plus real live human volunteers to help you or your family members through the process. You can phone them at 604-291-8863, drop into the constituency office at 4658 Hastings Street, or even send them a paper version and they’ll submit your application to the NEB online. – For business owners, Cred BC has prepared their own handy guide. – The National Energy Board has its own guide and help hotline here. – If you need to calculate the straight-line distance of your property from the proposed pipeline and tanker facilities, I used this Google Maps widget and it worked okay for me. – And finally, if you want to consult your friends and neighbours’ applications for inspiration, or just keep count of how many people are getting involved, the NEB posts them live right here. There are 517 right now. Can we get to 1,000 by February 12th? Poll finds they oppose the project, distrust federal process, but see little recourse. New polling from Vancouver-based Justason Market Intelligence finds a majority of British Columbians continue to oppose crude oil tanker traffic on the province’s North Coast. At the same time, most believe Enbridge’s Northern Gateway pipeline proposal will eventually go through. The poll was commissioned by the Dogwood Initiative, ForestEthics Advocacy, the Northwest Institute for Bioregional Research and West Coast Environmental Law. Only 29 per cent of those surveyed said they support “allowing crude oil supertankers through B.C.’s northern inside coastal waters,” while 64 per cent said they are opposed. Fully 50 per cent said they are “strongly opposed.” However, 64 per cent also said they believed the pipeline and tanker proposal would succeed, while only 12 per cent said it would fail. “The purpose of that question was to get a sense of whether people have a sense of inevitability about this,” said JMI principal Barb Justason. “I had a bit of a free rein here, and I was curious.” The poll was conducted between Jan. 13 and 19 — one month after the National Energy Board recommended the federal government approve the Enbridge proposal. It’s up to the U.S. President to decide whether the cross-border leg of the Keystone XL pipeline is in the national interest of his country. Ultimately, his criteria are less scientific than political. Does he stand to lose more by alienating those who support or oppose the project? With midterm elections coming up in November, Obama doesn’t have time to worry about Canada’s hurt feelings. Our economy, environment and opinion are very low on his list of priorities. But the strongest pro-Keystone arguments on the American side raise an uncomfortable question: if the pipeline is approved, who benefits a little bit — and who benefits a lot? In other words, who gets the short end of the stick? Catch that? It sounds a lot like the old story about exporting logs and buying back the furniture. Our domestic politicians tell us we’re an “energy superpower,” but to hear U.S. analysts describe it, we’re more of a convenient resource colony.